So my old school Basic game last Friday went great! I got to play a witch from my own book that I didn't roll up myself. It was so great. Yes we were all 1st level characters. At one point we were attacked by giant rats, but since my familiar is a rat I managed to talk our way out wit no bloodshed and we even got the heads up on some of the monsters. Our DM is using some houserules and they worked out fine. What I think I am enjoying the most is that the game is set in the Known World of Mystara! It was mostly a younger crowd. Yes. My dice were older that everyone play save for me and the DM. 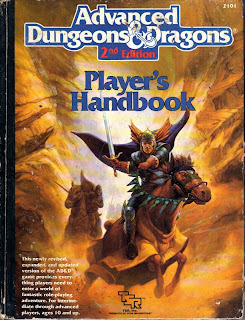 Next session we are converting over to AD&D 2nd ed. One of the player has never played 2e and most of the players there never had played Basic either. Our DM, Greg, is going to let me use my old 2e Netbook of Witches too once we convert. We figure we will try out a few "old school" systems and then stick with what we like. I have a feeling we will land on 2e in the end. It seems to do what we want to do best. Though we are looking pretty hard at +Joseph Bloch's +Adventures Dark and Deep for some ideas. In any case this is going to be a lot of fun. More 2E love on the blogosphere, nice!